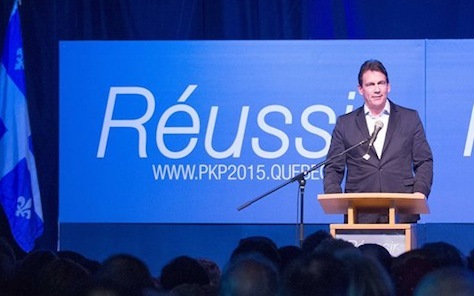 It wasn’t a surprise that Pierre-Karl Péladeau won the leadership of the Parti québécois (PQ) last weekend. 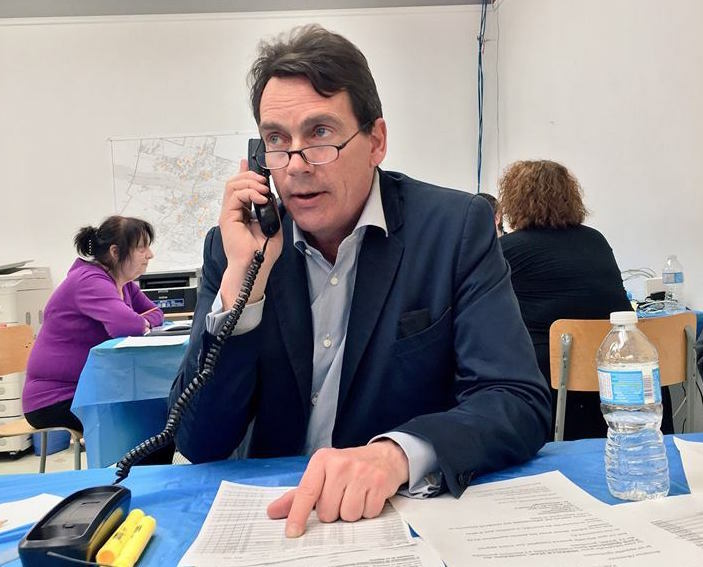 Péladeau, the former CEO of Quebecor, the province’s leading media corporation, took the leadership easily on the first ballot with 57.6% of the vote. 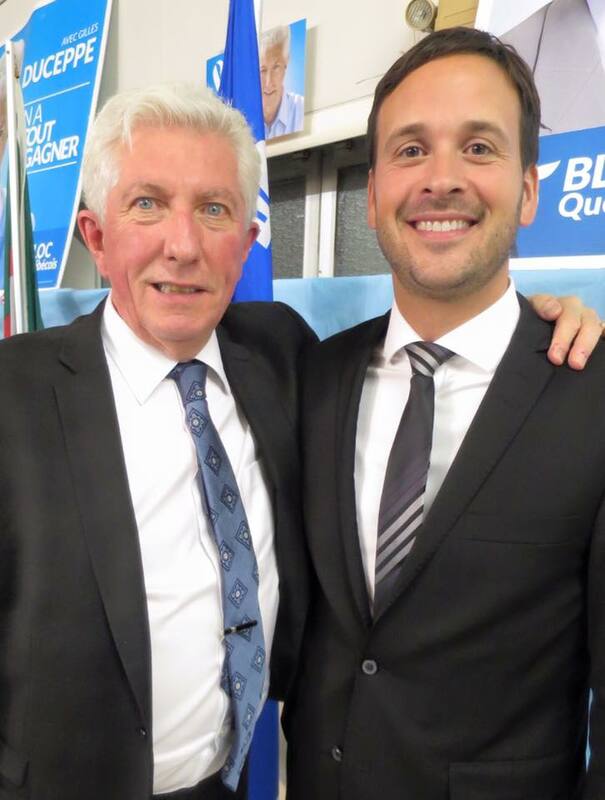 He easily defeated Alexandre Cloutier, a young moderate who nevertheless placed second with 29.21% of the vote, and Martine Ouellet, a more traditional PQ leftist. But Péladeau’s victory was sealed earlier this year when the momentum of his campaign forced heavyweights like Jean-François Lisée and Bernard Drainville out of the running. 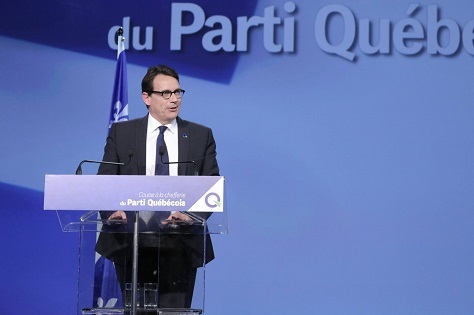 Péladeau, accepting the party’s leadership with a vow to ‘make Québec a country,’ has a huge task ahead. 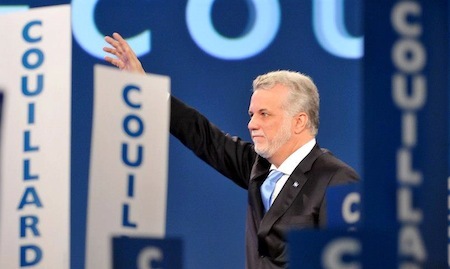 After just 18 months in office, the province’s voters rejected the minority PQ-led government in April 2014, restoring to power the Parti libéral du Québec (PLQ) under the leadership of former health minister Philippe Couillard. 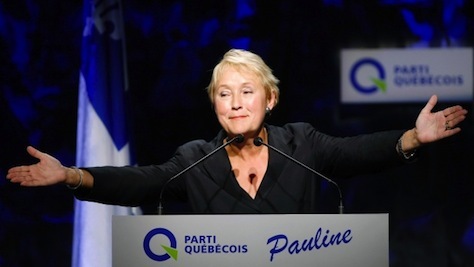 It was a disastrous defeat for the PQ and for premier Pauline Marois, who lost her own riding in the provincial election. Péladeau, who thundered into the election campaign as a first-time candidate, quickly overshadowed Marois with talk of a fresh independence vote for the province, forcing Marois to spend weeks talking about hypothetical referenda, currency and border questions. 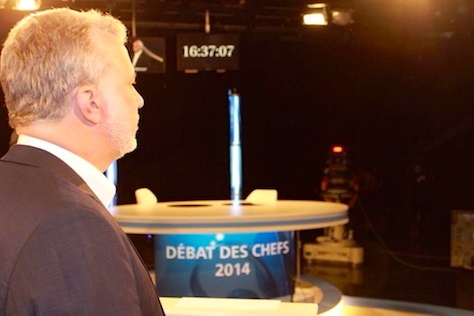 Arguably, the PQ never subsequently regained a credible shot at winning the election. Moreover, Péladeau has sometimes stumbled throughout the months-long campaign often designed as an exercise in rebuilding. He never fully repudiated the party’s disastrous (and many would say illiberal and racist) attempt to enact the charte de la laïcité (Charter of Rights and Values) that, among other things, would have banned government employees from wearing any religious symbols. In March, Péladeau said that ‘immigration and demography’ were to blame for the independence movement’s waning support. As a media tycoon who has pledged only now upon his election as PQ leader, to place his Quebecor stock in a blind trust, leftists throughout Québec remain wary of his leadership. His battles to defeat unions as a businessman are as legendary as his temper. 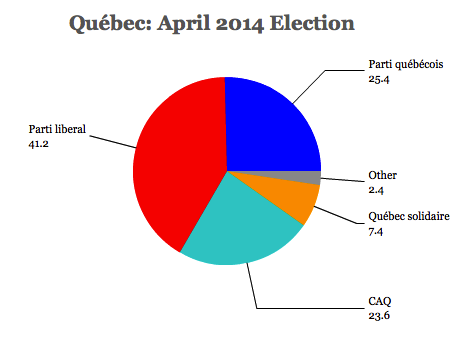 The latest Léger Marketing poll from April 11 shows the PLQ with a stead lead of 37% to just 28% for the PQ. François Legault’s center-right, sovereigntist Coalition avenir Québec (CAQ) would win 21%, and the pro-independence, leftist Québec solidaire would win 10%. We’re beginning to hit the peak of what’s perhaps the busiest world election season of the past few years. 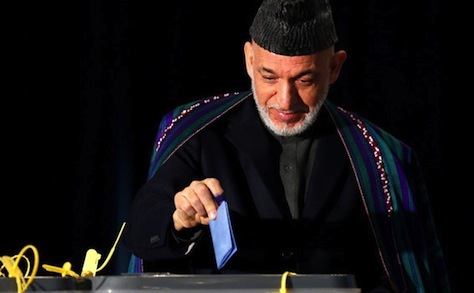 What began as a slow year with boycotted votes in Bangladesh and Thailand in the first two months of 2014 snowballed into a busier March, with important parliamentary elections in Colombia, the final presidential vote in El Salvador, parliamentary elections in Serbia, a key presidential election in Slovakia, and municipal elections that upended national politics in France, The Netherlands and Turkey. But the pace only gets more frenetic from here. When Québec premier Pauline Marois called a snap election earlier this month, the conventional wisdom was virtually certain on two points: that Marois’s sovereigntist Parti québécois (PQ) would win a majority government and that the election would turn on the Marois government’s introduction of the Charte de la laïcité (Quebec Charter of Values). Less than two weeks later, one poll today shows that the PQ is actually trailing the more centrist, federalist Parti libéral du Québec (Liberal Party, or PLQ). The CROP/La Presse poll finds that the PLQ would win 39% of the vote, the PQ would win 36%, and François Legault’s struggling, center-right, ‘soft’ sovereigntist Coalition avenir Québec (CAQ) would win just 13%. 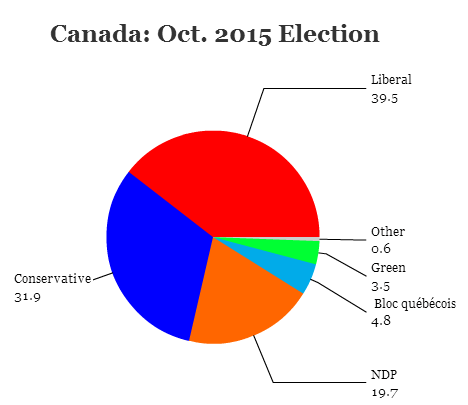 Québec solidaire, the more leftist, sovereigntist alternative, wins 10%. 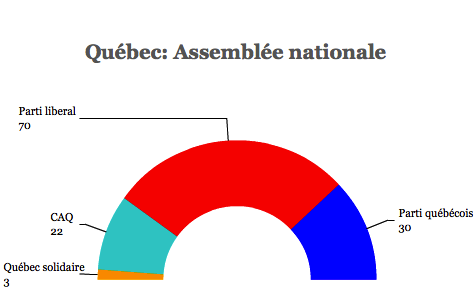 The PQ still leads among Francophones by a margin of 43% to 30%, though the Liberals win 71% of Anglophones. Far from winning a majority government, Marois could actually lose her minority government if the Liberals keep gaining strength. 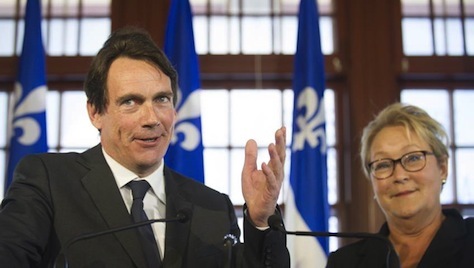 What’s more, the emergence of former Quebecor CEO Pierre Karl Péladeau (pictured above, left, with Marois) as a PQ candidate fundamentally transformed the election’s focus away from the cultural issues surrounding the religious freedom debate and the Charter of Values — and toward the issue of Québécois independence. Right now, that’s working to the benefit of Liberals, because a majority of Québec voters today oppose independence. Péladeau, when he announced his candidacy last Sunday for the PQ, surprised everyone by declaring his strong support for Québec’s independence. That took the focus off Marois’s Charter of Values and put it squarely on whether Marois will call a referendum if the PQ wins a majority government on April 7. Marois herself spent last week musing about an independent Québec, including post-succession monetary policy and retaining the Canadian dollar. That made it look as if Péladeau is more in control of the PQ campaign than Marois, thereby undermining Québec’s sitting premier. This week, with the PQ’s poll numbers declining, Marois is now trying to avoid talking about the sovereignty issue and limit the damage from her star candidate’s outspoken entry into provincial politics. The idea was that Péladeau, as a well-known businessman, would give the PQ more credibility on economic policy, thereby peeling away some of the more economically conservative voters that previously supported Legault and the CAQ in the last election — and maybe even some Liberals. Despite polls that generally show a slim but steady lead for Québec premier Pauline Marois’s government, her decision to call snap elections after just 17 months in office leaves her party, the sovereignist Parti québécois (PQ) is hardly a lock to return to power, let alone to win a majority government. 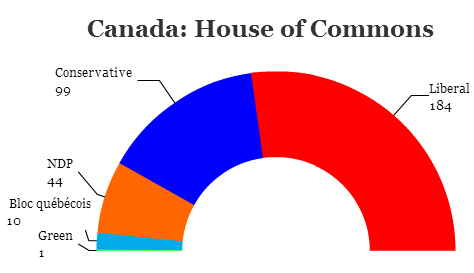 That makes the April 7 race to elect all 125 members of the Assemblée nationale (National Assembly) an incredibly high-stakes moment in Québécois politics — and, by extension, Canadian politics. In contrast to the September 2012 election, essentially a referendum on a decade of rule by the Parti libéral du Québec (Liberal Party, or PLQ) and premier Jean Charest, the upcoming spring election will instead be a referendum on Marois (pictured above) and whether the province is willing to entrust a majority government to Marois’s separatist, leftist party. 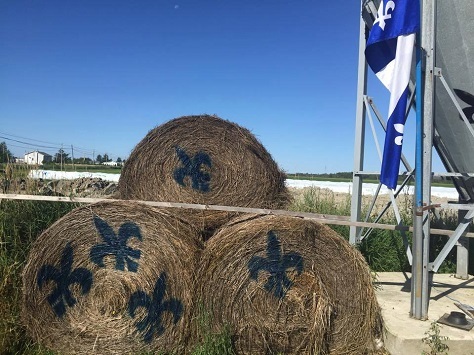 If Marois loses, it will take the wind out of the sails of the sovereignist movement in Québec, especially just a year before federal elections in Canada in which the Bloc Québécois, a PQ-affiliated party meant to represent the province’s interest in Ottawa. If Marois wins, it might be the last opportunity for the Meech Lake/Charlottetown generation of Québécois politicians to push forward with a third (and possibly final) referendum on Québec’s independence. One year into the minority government of Québec premier Pauline Marois, the province is again at the center of controversy with a new attempt to legislate a ‘charter of Québec values’ that’s drawing ire from the rest of Canada. 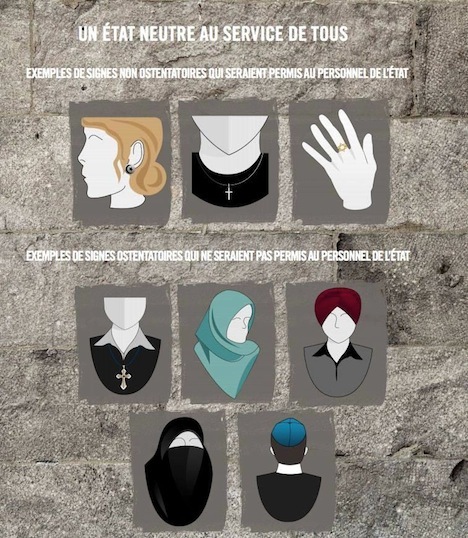 That chart above isn’t a joke — it was released yesterday by Québec’s government, and it purports to demonstrate examples of ‘non-ostentatious’ signs that state employees are permitted to wear. You’ll note that two-thirds of ‘approved’ examples are Judeo-Christian religions and three-fifths of the ‘banned’ examples are not. The ‘secular charter’ (la charte de la laïcité) would ban public sector workers from wearing kippas, turbans, burkas, hijabs or ‘large’ crucifixes. Remember that in Québec, the public sector is quite expansive, so the charter would capture not only folks like teachers, police and civil servants, but employees in Québec’s universities and health care sector as well. For good measure, the proposed charter would also tweak Québec’s Charter of Human Rights and Freedoms to limit religious exemptions, though it wouldn’t eliminate subsidies to religious private schools in Québec that are largely Catholic and largely funded by the state and it wouldn’t eliminate property tax exemptions for churches and other religious buildings. In short, the charter looks less like a secular bill of rights than a sop to French Canadians to perpetuate preferred legal and cultural benefits at the expense of other ethnic and religious groups — tellingly, the crucifix hanging in Québec’s provincial assembly would be exempt from the law. A charter that, at face value, purports to secularize Québec’s society, would actually enshrine the dominant Catholic French Canadian culture and exclude Canada’s growing global immigrant population from many of the religious freedoms typically associated with a liberal democracy. If passed into law, it would conflict with the religious freedom guaranteed in Canada’s Charter of Rights and Freedoms (essentially, Canada’s bill of rights) — Québec did not sign the federal Charter, nor did it approve of the 1982 constitutional settlement, but remains subject to the federal Charter. That means the ‘secular charter’ could once again put Québec on a collision course with the rest of Canada. It’s also the latest salvo in a series of only-in-Québec culture-war misfires that have plagued the Marois government since it took power last year, and it goes a long way to explaining why Marois and the sovereignist Parti québécois (PQ) are in danger of losing the next election. 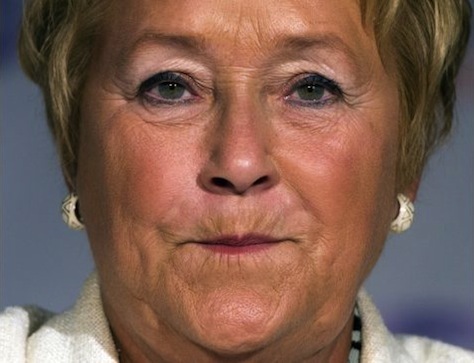 Over the past year, it would have been enough for Marois to declare victory on the issue of student fees and largely pacifying student protests, to declare that her government would largely continue Charest’s Plan Nord, a push to develop Québec’s far north in pursuit of resources over the coming decades, and to focus on bringing investment and jobs to Québec. Marois’s government has also pushed to end support for Québec’s notorious asbestos industry, winning plaudits from environmentalists. But if you want to know why Marois’s minority government isn’t in a more commanding position, it’s because it has pursued language and culture legislation as a time when Québec, which wasn’t exactly Canada’s most growth-oriented province to begin with (its per-capita GDP of around CAD$43,400 is CAD$5,500 less than neighboring Ontario’s and a staggering CAD$35,000 less than resource-rich Alberta), is falling behind the rest of Canada. Between August 2012 and August 2013, Canada’s unemployment rate has dropped from 7.8% to 7.6%, but in Québec, the unemployment rate rose from 7.8% to 8.1%. Instead, her government has plunged Québec back into the language wars, drawing ridiculous global headlines — a great example is the crackdown of the Office québécois de la langue française against a Montréal Italian restaurant’s use of the word ‘pasta’ and other Italian words on its menu and demanding the restaurant print their French equivalents more prominently. (Though we all know that apéritif or hors-d’œuvre is not the same thing as antipasto are not the same thing). 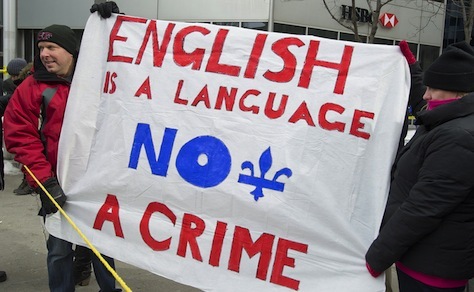 It comes after the Marois government has largely given up its year-long fight to pass Bill 14, which would amend Québec’s La charte de la langue française (Charter of the French Language, also known as ‘Bill 101’) by allowing the government to revoke a provincial municipality’s bilingual status if the anglophone population falls below 50%, requiring small businesses (of between 26 and 49 people) to use French as their everyday workplace language, and mandating that all businesses that serve the public use French with customers. 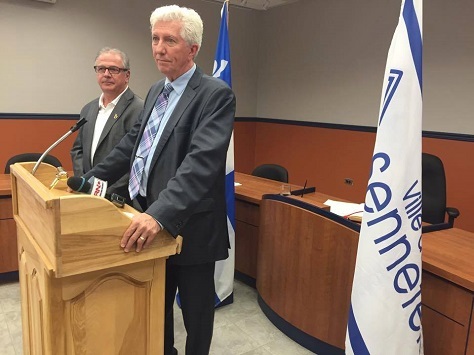 As unbelievable as it seems, the Jean Charest era is firmly over in Québécois politics. Philippe Couillard, his former minister of health and social services, is now the leader of Québec’s Parti libéral du Québec (Liberal Party, or PLQ), which narrowly lost its reelection campaign in September 2012 for what would have been a fourth consecutive term in government under Charest. 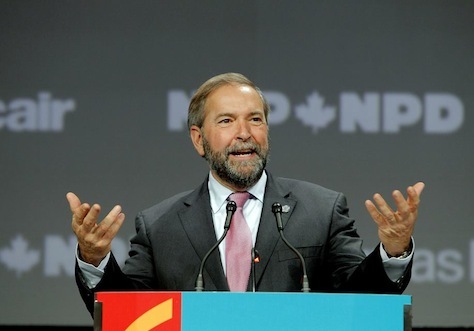 As expected, Couillard won on the first ballot with 58.5% of the vote — the convention lacked the drama of January’s Ontario Liberal Party convention that saw Kathleen Wynne win the leadership in Canada’s largest province, thereby paving the way for Wynne to succeed Dalton McGuinty as Ontario’s premier. So who is Couillard and what does his elevation as Québec’s chief opposition leader mean for the province and for Canada? A neurosurgeon by training, Couillard came to provincial government in 2003 as a member of the provincial legislature from Mont-Royal, a constituency in Montréal, though he stepped down in 2008 after a relatively successful stint as health minister, where he oversaw a ban on public smoking in the province. 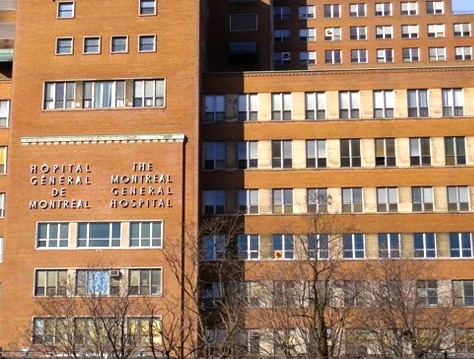 During the leadership race, Couillard received criticism for his partnership with Arthur Porter, the former head of McGill University’s health center, who is living in the Bahamas and wanted on fraud charges in respect of a 2010 contract to build McGill’s new hospital — Couillard had partnered with Porter for a consulting venture in 2008 upon returning to the private sector. Couillard must now win a seat in the Assemblée nationale du Québec, although he may well wait until the next election, and he’s said that winning a new seat is not a top priority for him — Jean-Marc Fournier, who served as the interim party leader, will continue for now as the PLQ floor leader in the provincial assembly. Because the current sovereigntist Parti québécois (PQ) holds only a minority government under premier Pauline Marois, Québec could return to the polls, perhaps even within the year. So it’s fair that rebuilding and rebranding Québec’s Liberal Party is a more pressing task for Couillard in the months ahead. 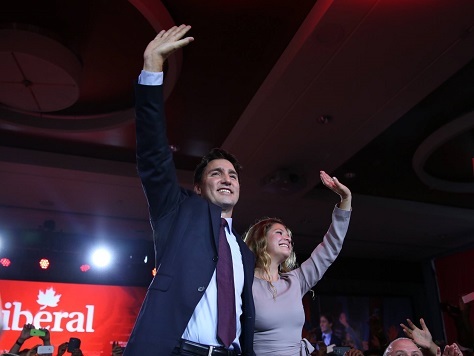 He proposed that a new round of constitutional talks could include other issues, such as prime minister Stephen Harper’s proposal to reform the Senate. “This could be one window of opportunity,” he said adding that another more “symbolic window” would be the 150th anniversary of Confederation. That’s slightly perilous talk for any Canadian politician in light of the constitutional battles of the early 1990s — the 1990 Meech Lake accord failed and Canadians voted down the Charlottetown accord in a 1992 referendum, one of the reasons for the implosion of Progressive Conservative prime minister Brian Mulroney’s government. Three years later, Québec voted by only the narrowest of margins to remain within Canada in a referendum on its future status. Charest, a federalist who led the Progressive Conservatives in the 1997 Canadian federal elections, left national politics for provincial politics in 1998, and his Québec premiership sought to downplay constitutional and sovereignty issues.